Smash Cake from Bev Sykes on Vimeo. I was ready to call it a day after I'd won the 5th canasta game of the day but the Queen of Mean was determined to beat me. I told her that I felt so bad at beating "the old lady" so many times that I would play another game, but that this time I would let her win. She wants me to believe that she won fair and square. Harumph. It's my story and I'm sticking with it. "Deal," she said, through clenched teeth after her win, pushing the cards across the table to me. It was kind of a Kirk Douglas / Jack Nicholsen kind of moment. I knew that my winning vibes had come and gone but she insisted and so we played one last game. I still think that 5 games to 3 constitutes a good day on my part, don't you? 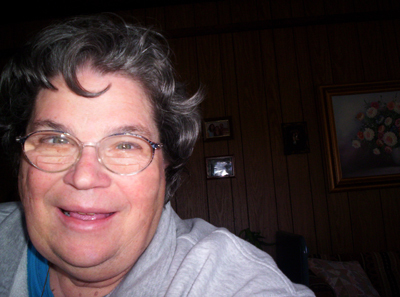 Other than the steam rising from my mother's ears at various periods throughout the day, it was a fairly quiet day around here. In the morning I settled in at the computer and finished my Davis Musical Theatre article. I had to cut and slash it because it was running so long that I called Derrick to get a word limit. 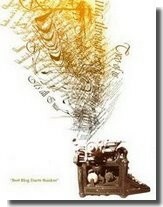 He told me not longer than 2000 words -- I was already over that and had several major things I wanted to include. I feel bad that I had such wonderful interviews with so many people and in the end could only use a teeny bit of what they told me. But I e-mailed the article to Jeri (who is quoted in it) and she told me it was "awesome," so I hope Derrick thinks so too, and that members of the company feel I did right by them. Today was supposed to be another wound appointment, but the wound nurse had gone home sick and so we have no appointments now until Friday. With all that free time, we each took a nap, we watched the birds fritter about on the front porch and the quail come to sup at the bird feeder off the back porch. My mother watched her soap opera while I worked. She got more phone calls from friends than I get in a month. Everybody wonders how she is and wants to help out. I worked on the computer for a bit and created an Easter look. 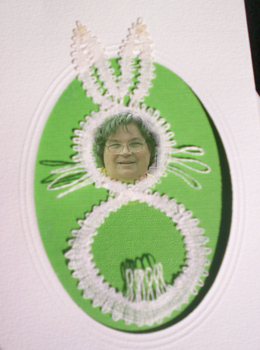 Her husband's cousin teaches lace making and sent her this cute Easter card. Of course, the cute Easter card didn't include a face, but I was feeling frisky. We go by the clock here. Breakfast is within 30 minutes of getting up, lunch is at noon, drinks are between 4 and 5 and dinner comes within an hour after that (whether I've finished my drink or not). Ice cream is served at 9 p.m. But that all leaves plenty of time for canasta, in between feeding time. I have a feeling I've shot my wad this trip. I know when to hold them and when to fold them, but I'm not going to be able to walk away ... or run ... until Friday, after we've seen the wound doctor again. I expect to hear lots of cackling from the old lady tomorrow as she takes me to the cleaners.